ARE YOU BORED with your current fitness routine? It may be time to kick your way to one of the hottest workouts around. Kickboxing, also referred to as boxing aerobics and cardio kick-boxing, is a hybrid of boxing, martial arts and aerobics that offers an intense cross-training and total-body workout. It blends a mixture of high-power exercise routines that strengthen the body and mind, decrease stress and hone reflexes while increasing endurance and cardiovascular power. While kickboxing’s roots are in full-contact fighting, it has found a safe and very effective niche in the fitness community. Many people are drawn to kickboxing because it increases self-esteem while burning an average of 500 to 800 calories an hour, as opposed to the 300 to 400 calories typically burned by the average hour-long step aerobics class. But before you kick down the door to the next class, take time to consider some of the basics of this sweat-intensive workout. Keep in mind that many clubs may not offer classes that are based on progression. Even if your current routine features a hearty combination of cross-training workouts, you may want to take it easy at first, then build as your body adapts. For this reason, an hour-long session may not be the wisest choice for someone who isn’t used to this level of concentrated activity. Remember, adequate warm-up and close attention to proper technique are paramount. Classes should begin with basic stretches and a light cardio-vascular warm-up such as pushups and jumping jacks. A typical aerobic kickboxing routine involves a series of repetitive punches alternating with hand strikes, kicks and then a combination of all three. The repetitions help participants focus on proper technique while engaging several muscles groups and getting a fierce cardiovascular workout. After the main section of the routine, stretches and floor exercises are commonly performed as a cool-down. And of course, you should ask your instructor about their training. Cardio kickboxing is a combination of martial arts and aerobics, and employs different techniques from a “pure” martial arts class. Many teachers may have boxing or martial arts training, but may not have the appropriate class experience or be properly certified by an organization such as ACE. Finally, once you understand the basics of this stress-relieving, total-body workout, you can kick your way to a new level of fitness. 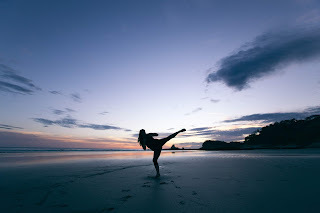 • The Roundhouse Kick - Starting from a basic stance (side of body facing bag, knees slightly bent, shoulder-length apart), lift your right knee and point it just to the right of your target. Pivot on your left foot as you extend your right leg. Kick the target with the top of your foot. • The Side Kick - From the basic stance, pull your right knee up toward your left shoulder. Pivot on your left foot as you snap your right leg into your target. Strike with either the outside edge of your foot or your heel. Don’t forget to wear loose clothing that allows freedom of movement during your kickboxing workout and drink plenty of water. And most especially, don't forget to apply the best workout makeup that lets you sweat and lets your skin to breath but doesn't clog your pores and stays your skin healthy. If you don't know that kind of makeup that giving you that way, click here to go to Fitcover homepage.